I'm happy to tell your that Nautilus I will be featured in the 'Show your hand' exhibition, part of the COAST Festival held by the Banff and Buchan Arts Forum. 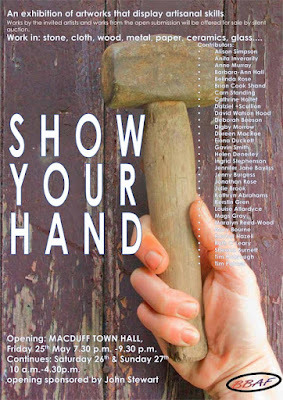 'Show your hand' focuses on traditional craft skills - their place in the modern world and how much we as a society would lose were they to be forgotten. It will feature work by artists and craftspeople working in a range of skills and materials - stone, wood, metals, ceramics and glass as well as textiles, which I think shows that while there's no room for complacency and it's always good for more people to learn about traditional crafts, many skills are in very good hands with a huge range of beautiful objects still being made. The exhibition runs from 25 to 27 May in Macduff Town Hall; many of the pieces are available to buy (including Nautilus I). So, if you're in the Aberdeen area next weekend, it should be well worth a visit. Why not pop along! Darn it, I'll be in Worcestershire! Hope it goes well, anyhow! What are you up to atm? Too far to drive, sigh!